With only few hours left to spend in Venice, we began our day by having cheap and delicious breakfast across our apartment. 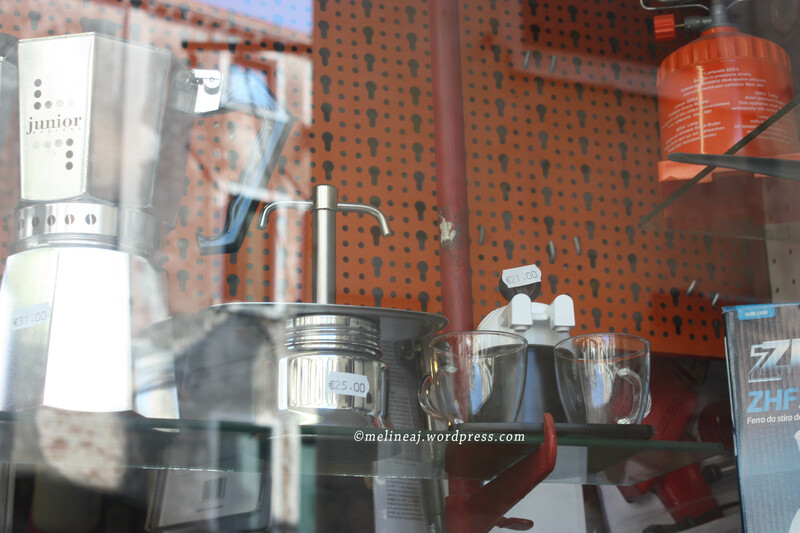 We noticed a small sandwich shop, Bacareto Da Lele, that always packed with people. When I searched Trip Advisor for this tiny cafe, it showed a pretty high rating due to its €1 mini sandwich and cheap wine. So, we decided to have a little breakfast there. Bacareto Da Lele has different types of mini sandwich, we bought 2 mini sandwiches which only cost us €2!!! That’s the cheapest meal we had during entire Europe trip! Obviously, the ‘mini’ sandwich didn’t make my hubby full, so he bought another one but for me, it was quite filling. The cafe also sells Spritz (€1.30), the wine-based cocktail that is well known in Venice. Since, it’s too early to drink alcohol, I passed… but then I regretted it since we didn’t find anywhere else serving Spritz. Bacareto da Lele & the €1 mini sandwich! With full stomach, we walked to Rialto market. They have special seafood stall sections that sells fresh variety of seafood including Seppie (cuttlefish with its ink sac still attached), scallops, shrimps, etc. On the other side, there were fresh vegetable and fruit stalls selling various kind of sun-dried tomatoes, huge fresh tomato & figs, and the big Italian lemons! The fruits and vegetable stalls. The figs are huge! So are the tomatoes & lemons! We walked back to apartment to pick up our luggages and went straight to St. Lucia train station. We booked TrenItalia train in advance for 2 people from Venice to Rome that cost us €98. As I mentioned in my Europe Essentials post, it’s cheaper to buy the ticket online that at the train station (it’s €98 PER person if you buy it at the train station!). The schedule for Venice-Rome train is available pretty much every hour, so it’s super flexible. The train itself is pretty comfortable and clean! Through our journey, the train stops at various locations including Bologna and Firenze (Florence). The whole trip from Venice to Rome took about 3.5 hours. 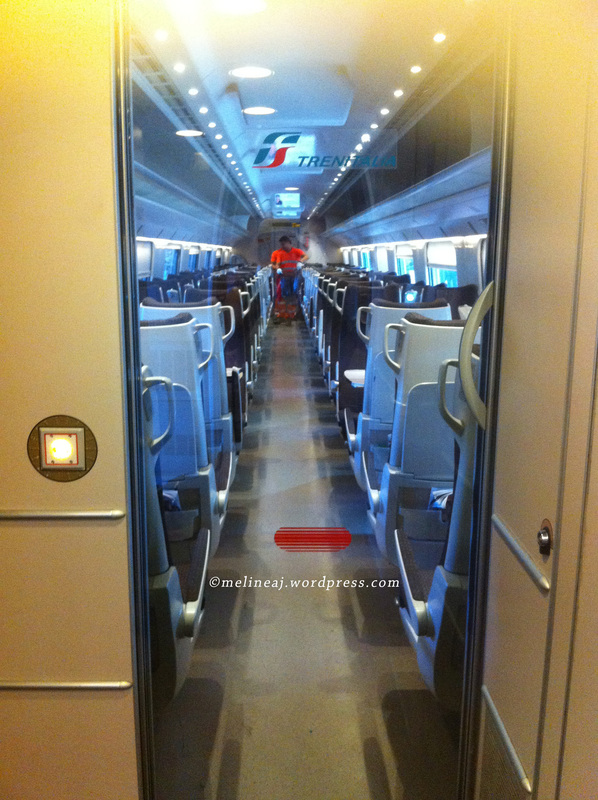 On the train from Venice to Rome… Love the view! Venice is challenging to navigate since there’s no free map and the narrow street is just like a big maze. The tourist map is available for €2-3 from the information booth but if you have a smartphone, you can download various free app for the free map. Aside from that, I think that Venice is a very unique city yet it’s packed with tourists from all over the world. The lack of clear signage for attractions is a bit challenging too although there are some yellow signage/mosaic at some corners pointing toward the famous areas (i.e. Farrovia- train station, Piazzale Roma- bus station, San Marco – basillica, Rialto- market & bridge). The street name is actually written in every corner but yeah… good luck keeping track of it. Anyhow, my tip is just GET LOST and ENJOY the walk through busy street. Familiarize yourself with the vaporetto system (although the information is vague). Learn the map, the location of the stations, and the scheduling. Once you get the hang of it, it’s actually pretty straight forward and very convenient. In my opinion, 2 nights are good enough time to browse around the venice and see major attractions – unless you want to go to Veneto (Venice mainlaind). I regret not trying Spritz & bottled Bellini while we were in Venice. I thought they will be available once we were in Rome – it’s still Italy anyway but I was wrong! I guess, I should buy one once it was available in front of me! so… don’t wait while it’s there! 1 Response to "Venice day 7 (Rialto Market & St. Lucia Train Station)"